It has been a while since I have reviewed a book and must confess that in more than 30 years of writing this is the first time I have ever been asked to review a comic book: but I am so glad this has been sent to me. 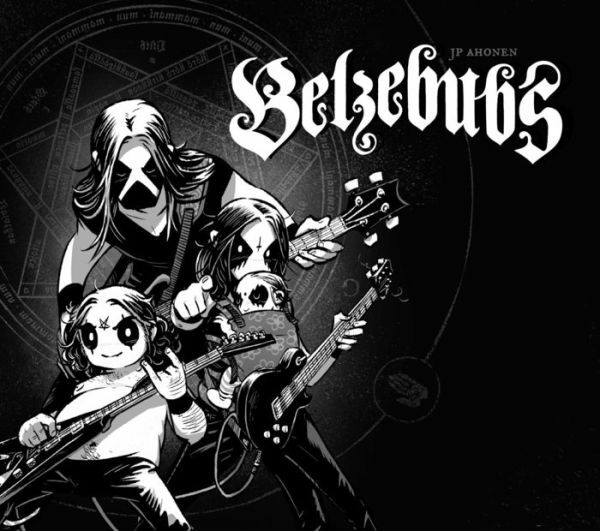 Finnish artist JP Ahonen has taken a loving nuclear family, and just given them the slight switch that they are all black metal fans who wear corpse paint all the time. We follow the story of the band, the daughter’s issues with wanting a “straight” boyfriend, and all the trials and tribulations one expects in a normal family. The humour reminds me somewhat of the wonderful Calvin & Hobbes series, taking a plot and spinning it 180 degrees. For example the son, Leviathan, is a disappointment when he removes his corpse paint and wants to say grace before a meal. You don’t have to be a follower of the genre to enjoy this volume, and even laugh out loud, but if you have some knowledge then it does add an extra level. Fancy going to the City of Dis and eating at either Dimmu Burger (this cracks me up each time I see it, I mean, this is solid gold!) or Pub-Niggurath (always felt these guys deserved way more credit)? I’ve been through this multiple times now, and the jokes don’t get old, while the stories which mix between long epics told over multiple strips and one-pagers contain solid artwork. While this can be read and enjoyed at face value, it is also an interesting take on the concept of an outsider and sub culture and portrays this as a happy loving family who in their own way are totally well-adjusted. Available through Amazon and are the usual book outlets this is a solid enjoyable read which I know I am going to be turning to time and again. Apparently there is also an album coming out through Century Media in April as well, so watch this space!